MARIUPOL, Ukraine -- Ruslan Abalmaz, a martial-arts enthusiast with intricate tattoos running down his arms, spent seven years in jail on extortion charges. 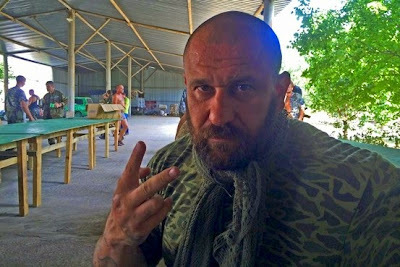 Ruslan Abalmaz at his battalion's camp outside Mariupol in eastern Ukraine in early August. He's now a police officer, a switch that would have seemed laughable to him just months ago. "It's a paradox," Mr. Abalmaz said as he raced a green-and-black van filled with men carrying automatic weapons through the streets of this seaside town, on their way to battle with pro-Russia insurgents. The rebellion that began in the spring initially made Ukraine look helpless on the battlefield. As rebels took over eastern cities, some opponents of separatism were kidnapped, tortured and killed. Ukraine responded in part with volunteer battalions, tapping into patriotism and anger unleashed by what many saw as foreign aggression. Fighting alongside regular troops and heavy artillery, these battalions are a cross-section of Ukrainian society. But they also include extreme nationalists and people like Mr. Abalmaz, who aren't prone to showing restraint. On a recent day, Mr. Abalmaz showed a municipal ID from a small town where his men had just fought. The card pictured a gray-haired man who looked to be in his 60s. "He's lying somewhere rotting," Mr. Abalmaz said, describing the man as a separatist. "We don't need him alive." Asked if the man had been armed, Mr. Abalmaz said, "No, he had no weapon, but they get their weapons at night." Later, Mr. Abalmaz said the man did have a pistol in his car and was trying to escape. As Kiev presses its military offensive against the separatists, these volunteers are playing a key role. They go into insurgent territory softened up by Ukrainian artillery and conduct block-by-block clearance operations, which bring them into contact with the civilian population as well. Any retribution against those deemed to have collaborated with the insurgents would risk undermining the broader battle for hearts and minds in eastern Ukraine, an industrial region where many people are leery of the rebels yet worried about Kiev's military campaign. But for now, men like Mr. Abalmaz are an asset for the government in Kiev. His fighters say he is the first to charge into battle, oblivious to bullets and mines, his bald pate and bushy beard unprotected by a helmet. He has a lot of experience. In the early 1990s, when two former business partners had a falling-out, each one separately approached Mr. Abalmaz to order a contract hit on the other partner. Mr. Abalmaz says he took money from both, but didn't kill either. Instead he claims to have staged their deaths, a ruse that was discovered when the two men ran into each other on the street. The two former partners brought extortion charges against Mr. Abalmaz, and he went to prison. Upon his release, Mr. Abalmaz says he plunged into another illegal—as well as lucrative and violent—line of work: black-market coal mines. He created his own private army to protect himself and his profits. At the very top, the black market was tightly controlled by businessmen close to the government of President Viktor Yanukovych, according to Ukrainian officials. After the president was ousted in a pro-Western revolution earlier this year, these businessmen began to finance a separatist movement in regions bordering Russia, Ukrainian officials say. Mr. Abalmaz, who had by then acquired a certain stature and reputation in his hometown of Torez just outside the regional capital of Donetsk, says those men—whom he had long known—offered him a role in the eastern rebellion. Initially, he got excited, but then, he reconsidered. He says he focused on protecting his business instead. By then, he says, he had managed to legalize it and was paying taxes. Another Torez kingpin, the owner of an automobile service station, made a different choice. Nicknamed "the Hog," he allied himself with a pro-Russia militia in the nearby town of Horlovka, then saw his influence rise as he became commander and brought them to Torez. The Hog and Mr. Abalmaz went to war, a political conflict with old-fashioned gangland overtones. Mr. Abalmaz's small, martial-arts army proved no match for the Hog's far better armed insurgents, and the coal merchant was run out of town. The Hog's people ransacked his apartment, and shot 38 dogs he kept in kennels outside of town, "to hurt me personally," he says. Mr. Abalmaz and his gunmen, at that point acting on their own without any coordination with Kiev, lurked in the woods, attacking insurgent checkpoints, killing rebels and taking their weapons. The Hog was killed in early July, according to local media reports, and Mr. Abalmaz claims responsibility. His account couldn't be independently verified. After a particularly disastrous insurgent attack this summer, Mr. Abalmaz's crew fled to Dnipropetrovsk, the capital of a neighboring region. There, they presented themselves to Hennady Korban, an aide to Ihor Kolomoisky, a banking tycoon and now regional governor, who has been financing Ukrainian volunteer battalions. Mr. Abalmaz's criminal past didn't spook Mr. Korban, who says the coal merchant is just one of many people who had problems with the police under the previous, allegedly corrupt regime, often in trumped-up cases. Mr. Abalmaz's recently formed Miner Battalion is financed partly through Mr. Kolomoisky's largess. The volunteers are integrated into the Ministry of Interior, which makes them police officers. Mr. Abalmaz says he ran into resistance from the regular police. "They said, 'He was dangerous in peacetime, don't give him weapons now,' " Mr. Abalmaz recalls. He was eventually cleared though, and became a police sergeant. Viktor Chelovan, who supervises the battalions at the Ministry of Interior, notes that at the outset of the separatist uprising, regular police, though unblemished by criminal records, refused to fight and many collaborated with the insurgents. So new kinds of people were needed. Despite his past, Mr. Abalmaz "proved himself to be a patriot and a good commander," he said. Mr. Chelovan said he had no evidence of illegal activities or abuses by the volunteers in recaptured territories. Warfare, especially the irregular kind, is hardly the province of Boy Scouts, and the separatists have their share of ruthless characters. One is a former Soviet special-forces soldier who spent three years in jail for fraud and later served as a bodyguard to a Donetsk underworld boss. "If you take a watch from a prisoner while he's alive, does that make you a marauder?" he asked, a pistol holstered under his armpit. He noted it was an expensive Tag Heuer. "Well, then I'm a marauder," he answered his own question. He says he killed him. Mr. Abalmaz's Miner Battalion set up camp in an open field outside Mariupol, a port city under Ukrainian control just a two-hour drive from Donetsk, the separatists' largest remaining stronghold. There are some 200 fighters here. They stage raids into insurgent-held towns, driving a ramshackle fleet of vehicles including a hastily armored pickup truck. Mr. Abalmaz is feared and respected by his soldiers. "He can hit you in the face and cuss you out, but he'll never betray you," says one volunteer, a former Soviet military officer from Donetsk. After a meeting with sponsors who came to see what his men need, Mr. Abalmaz loudly berated an underling for allowing his cellphone battery to run down. Then, he turned his attention to the battles ahead. "They better pray for God to stop me," Mr. Abalmaz said, referring to the separatists. "I won't show any mercy. If God so wishes, maybe I'll spare some people, otherwise I'll kill them like dogs."